Around 150 students in Malone College had the opportunity to come out from behind their desks today and learn from Mr. Billy Murray – a former World Kickboxing Champion who heads ProKick Kickboxing in Northern Ireland. 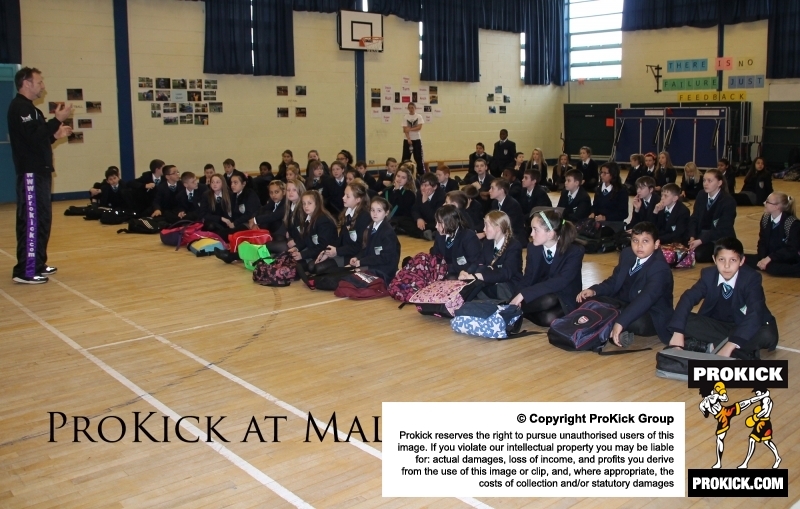 ProKick Kickboxing hits out at Malone College: Year 8 and Year 9 each spent 40 minutes with Mr. Murray as he shared his motivational and inspirational story that has seen him travel the globe with the sport of kickboxing as well as bridging religious and cultural divides at home with his PeaceFighters initiative. Having suffered from bullying whilst in school, Billy encouraged students if they were having any similar issues to find someone to talk to; perhaps a family member, teacher or friend. He also urged students to make the most of the opportunities that they have in school and to push themselves to achieve through education in such a way that will open doors for them in the future. On top of all this, pupils had a quick introduction to some of the foundational non-contact elements of kickboxing and enjoyed watching English teacher Miss Kathryn Warren do a little work on the pads with coach Murray. Pupils in Miss Warren’s classes certainly won’t be ‘forgetting’ their homework again soon! Next it was the turn of the Yr 11 GCSE Sport class; athletes some might say! They were ‘treated’ to an hour-long beginners kickboxing session. Some students were quicker than others to realise that respect is key in the kickboxing world and talking while training is taking place results in burpees….and there were plenty for some in the first 10 minutes! With everyone having their fill of the dreaded burpees, students engaged fully in learning the foundational and basic movements as well as evasive techniques. By the end of the session they were ability to put these moves together in what Billy Murray described as “poetry in motion.” The class ended with ProKick Says – a game which ensures students are focused and utilising their listening skills fully. The competition was fierce and with a coveted trophy up for grabs there were many in this Yr 11 class determined to win. Of course there only can be one winner and shortly after Mr Murray was heard say “Girls never win this.” Saskia McDowell proved him wrong with her focus and skills outshining the others. Well done Saskia! As if he hadn’t worked hard enough, when the final school bell went at 3pm Mr. Murray was still there with 18 keen students ranging from 11-16 who wanted more kickboxing action! They were also taken through a 45 minute beginners class, focusing on the discipline, respect and technique of the sport, again finishing with a ProKick Says competition. This time the boys came out on top with the final coming down to young Joshua Howden (8M) and aspiring boxer Kyle Fetherston (12N). Youth shone through and Joshua just came in ahead of Kyle to the win, his intense listening skills paid off and he went home with a ProKick trophy. Congratulations Joshua! Throughout the day students took every opportunity they could to talk to Mr. Murray, hold a World Title belt, and have their photo taken with Belfast’s very own four-time four-weight World Champion. Thank you to all the students who took part today! Watch this space for more on ProKick at Malone College! Dear Sir, I’m Hiro from Japan, your Japanese student. As a teacher, this article is wonderful. Recently, I have to deal with bullying problem among children. I talked with all the students, parents whose children were bullying and a parent whose children was bullied. This article helped me a lot!